(a) What is the average metabolic rate in watts of a man who metabolizes 10,500 kJ of food energy in one day? (b) What is the maximum amount of work in joules he can do without breaking down fat, assuming a maximum efficiency of 20.0%? (c) Compare his work output with the daily output of a 187-W (0.250-horsepower) motor. This is College Physics Answers with Shaun Dychko. The metabolic rate of this man is the total amount of food energy consumed, divided by the time in seconds. So we're told that he consumed 10,500 Kilojoules and so the kilo prefix is replaced with times 10 to the 3 here. And we divide that number of Joules by the amount of time and we're told this is one day. And so we express day in seconds. So one day times 24 hours per day times 3600 seconds per hour gives a metabolic rate of 122 watts. The efficiency is the work output of the man divided by the total energy consumed to do the work: the energy in. And we'll solve this for W out by multiplying both sides by E in. And then, switch the sides around. And so, the work output is going to be: efficiency, times the energy consumed. And the energy consumed is 10500 kilojoules times 20 percent efficiency, which is .2 as a decimal. And this works out to 2.10 times 10 to the six Joules of work done in one day. In part C, we're comparing the total work output of a human to that of a motor. And so, the work output of the motor, denoted with a subscript m, is 187 watts times the amount of time. So this is power multiplied by time. And the time we have to express in seconds. And this is one day expressed in seconds, and this is 1.61568 times 10 to the 7 Joules. And so we divide the work output of the human by the work output of the motor. 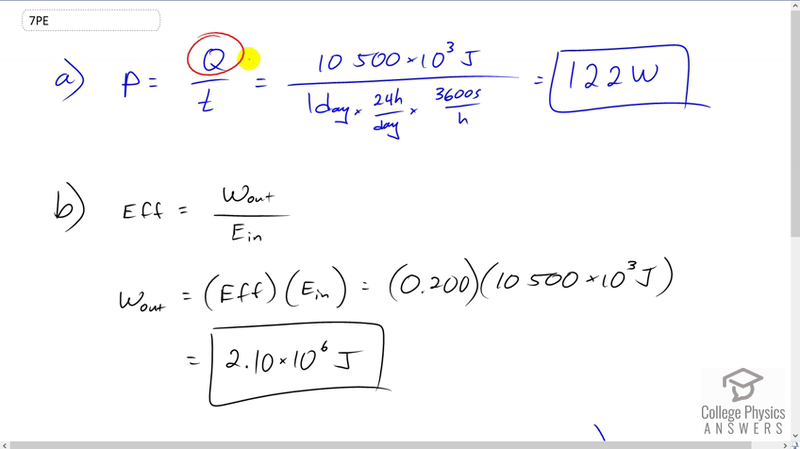 So it's 2.1 times 10 to the six Joules that we found in part B, divided by the work output of the motor, gives .13. So the man does 13 percent of the work of a motor.